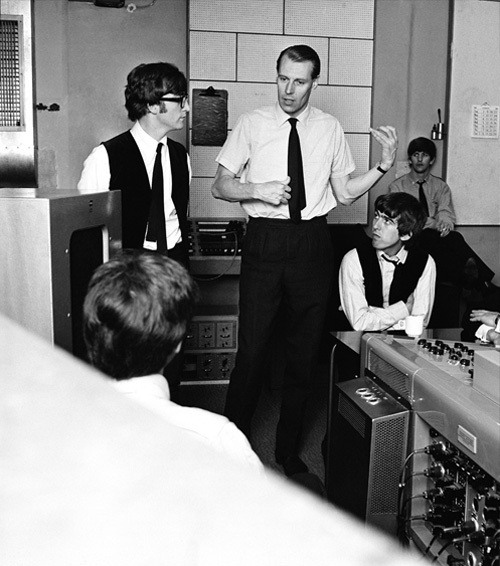 The greatest argument for George Martin’s musical genius may be this: He had an open mind and was willing to take what he later called “a calculated risk” in auditioning and signing The Beatles. Think about that. Martin didn’t like their “old stuff,” a bunch of cover tunes, or their “mediocre” originals. Decca, Pye, Phillips and virtually every other major record label in London had flat out passed on the band. At that point, common sense should have prevailed, with Martin tossing Beatles manager Brian Epstein out of his office and then heading to the corner tavern for a pint. But music, like love, isn’t about common sense. Martin, who died on March 8 at age 90, instead deferred to his curiosity and sense of adventure. “I simply thought it was worth a shot,” Martin said of the band. Then came a musical shot heard across the universe. Here we look at three areas of innovation where Martin clinched his title as the greatest pop producer of all time. For much of the 1950s and early ‘60s, record producers had clear roles. They found the songs their artists recorded. They guided bands and singers in much the same way film directors take actors through their paces. 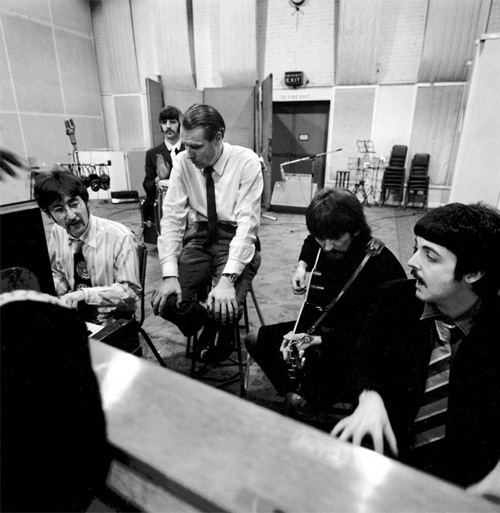 But Martin turned his producer-artist relationship with The Beatles into a collaboration. We take that dynamic for granted today, but it took Martin to realize it in ways never before explored. So when The Beatles wanted to hop genres on the same album, Martin helped them do it: not once, but twice, three times and arguably more. Martin wrote the string arrangement for “Rigby” and conducted the octet. 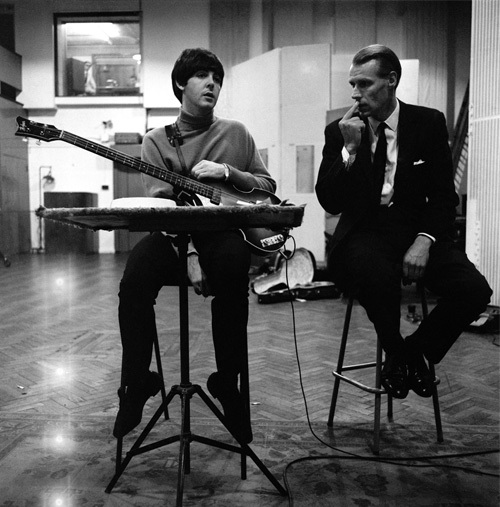 And to get Paul McCartney’s homemade loops on “Tomorrow Never Knows,” he and engineer Geoff Emerick, who was just 19 at the time, commandeered five studio tape machines. “With each fader carrying a different loop, the mixing desk acted like a synthesizer, and we played it like a musical instrument, too,” Emerick added. No doubt. This was done live, in one off-the-cuff take. Remarkable as it sounds today, EMI Studios, known today as Abbey Road, was a place where technicians wore white lab coats and engineers were constrained to operate by the book, and a very strict book at that. But when The Beatles came to Martin requesting certain sounds, he didn’t break out the Abbey Road studio code and cite section 12-B-4. He condoned bending and breaking the rules — and often did so himself. “John said he wanted to ‘smell the sawdust on the floor,’ wanted to taste the atmosphere of the circus,” Martin said, as quoted in “The Beatles Recording Sessions,” by Mark Lewisohn. “So I got a hold of old calliope tapes, chopped the tapes into small pieces, and had Geoff Emerick throw them up in the air, reassembling them at random.” It took two “takes” to get the tape pieces scrambled just enough to get the effect Martin wanted and that Lennon sought. We will bow out of the Fifth Beatle debate, but George Martin’s influence on The Beatles artistic output was specific, sizable and longstanding. Plus, he actually played on the records and made artistic decisions that directly affected the band’s sound and success. “Martin completely adapted himself to what The Beatles’ needs were, taking them to places they couldn’t get to themselves,” Caro says. there would be no piano solo on “In My Life.” Martin achieved the baroque feel by recording the solo one octave down at half speed. On the finished song, it plays back one octave up at double speed. there would be no harpsichord on “Fixing a Hole” or piano solo on “Lovely Rita,” both of which Martin played. “Please Please Me,” may never have reached No. 1. Still growing as songwriters, Lennon and Paul McCartney presented Martin with “Please Please Me,” written in the style of Roy Orbison, the band’s friend and tour mate. Ron Richards, who worked the earliest Beatles sessions, recalled to Lewisohn: “We were standing in the corridor outside the control room after the session. George was saying, ‘We haven’t quite got “Please Please Me” right, but it’s too good a song to just throw away. We’ll leave it for another time…’” Martin had them speed up the song and throw in some tight harmonies.